Hugh Masekela, South African Jazz Master And International Chart-Topper, Dies At 78 : The Two-Way He recorded more than 40 solo albums and performed with musicians ranging from Harry Belafonte to Paul Simon. Masekela died after a prolonged battle with prostate cancer. South African musician Hugh Masekela, performs in New Delhi in 2004. Hugh Masekela, the legendary South African jazz musician who scored an unlikely No. 1 hit on the Billboard chart with his song "Grazing in the Grass" and who collaborated with artists ranging from Harry Belafonte to Paul Simon, has died at 78 after a protracted battle with prostate cancer, his family announced Tuesday. "[Our] hearts beat with profound loss," the Masekela family said in a statement. "Hugh's global and activist contribution to and participation in the areas of music, theatre, and the arts in general is contained in the minds and memory of millions across 6 continents." Over his career, Masekela collaborated with an astonishing array of musicians, including Harry Belafonte, Herb Alpert, Bob Marley, Fela Kuti, Paul Simon — and his ex-wife, Miriam Makeba. For almost 30 years, "Bra Hugh," as he was fondly known, was exiled from his native country. And almost despite himself — as he struggled for decades with copious drug and alcohol abuse — Masekela became a leading international voice against apartheid. Masekela heard township bands and the music of the migrant laborers who would gather to dance and sing in the shebeen on weekends. One of his uncles shared 78s of jazz musicians like Louis Armstrong, Duke Ellington and Glenn Miller. Those two forces, the music and the booze, did much to shape Masekela's life. He began drinking at age 13. He was given his first trumpet at age 14 by an anti-apartheid crusader, the Rev. Trevor Huddleston, who was also the superintendent of a boarding school that Masekela attended. "I was always in trouble with the authorities in school," Masekela told NPR in 2004. He had been inspired by the Kirk Douglas film Young Man with a Horn. Huddleston, hoping to steer him away from delinquency, asked what it was that would make Masekela happy. "I said, 'Father, if you can get me a trumpet I won't bother anybody anymore.' "
Masekela soon became part of the Huddleston Jazz Band. And the priest managed to get one of the world's most famous musicians to send young Hugh a new instrument, as Masekela told NPR in 2004. "Three years later," Masekela recalled, "[Huddleston] was deported and came through the United States on his way to England and met Louis Armstrong and told him about the band. And Louis Armstrong sent us a trumpet." By the mid-1950s, he had joined Alfred Herbert's African Jazz Revue in Johannesburg; within just a few years, Masekela was good enough to co-found a landmark South African band, The Jazz Epistles, which also featured another landmark South African artist, the pianist and composer Abdullah Ibrahim. They recorded the first modern jazz record in South Africa featuring an all-black band. Within months of The Jazz Epistles' creation, South African police opened fire on thousands of protesters and 69 people were killed in the infamous Sharpeville Massacre of 1960. The apartheid government declared a state of emergency, and The Jazz Epistles couldn't play together. Meanwhile, Masekela had learned that he was being targeted for his anti-apartheid activities, and he had made friends with a talented singer named Miriam Makeba, who had already fled the country for New York. Masekela, now 21 years old, was scrambling to secure a passport and papers to study music abroad. And his friendship with Makeba proved crucial, as he told NPR's Tell Me More in 2013. She and the singer and activist Harry Belafonte became his patrons and mentors. Masekela had originally planned to head to England to study at the Guildhall School of Music & Drama. But once he was there, Makeba encouraged him to head to New York. "We'd always dreamt of coming to the States, but she came a year earlier and blew the States away," he told NPR. "So she said, 'Hey, you got to come, forget about London, this is the place to be.' And she was on a first-name basis with everybody. Then she and Harry Belafonte gave me a scholarship to Manhattan School of Music. I also had to work part time in Harry Belafonte's music publishing, because they ain't going to give you no money," Masekela said. In short time, Masekela and Makeba became romantically involved; he also recorded with her and appeared on her album The Many Voices of Miriam Makeba. They married in 1964, despite the fact that their relationship was already tempestuous. Their marriage — one of four for Masekela — ended after barely two years. At night, Masekela would go to the city's great jazz clubs to catch the likes of Miles Davis, John Coltrane, Thelonious Monk, Charles Mingus and Max Roach. He wanted to be a jazz player in the same bebop style as his heroes, and that's what he sounded like. But several of those giants gave him some solid advice. One of them was Miles Davis, as Masekela told NPR's Morning Edition in 2004. "I have a lot of great musical encounters with Miles, and he said, 'Yeah. Yeah. You're trying to play like me,' " Masekela said. "Miles was a funny guy. He said, 'Listen, I'm going to tell you something. You're going to be artistic because there's thousands of us playing jazz but nobody knows the s*** that you know, you know, and if you can put that s*** in your s***, then we're going to be listening.' "
Masekela decided to put Davis' advice to work. He put that bleep in his bleep, and began to develop his own, distinctive style — a blend of jazz, soul and one of the South African dance styles he had grown up with: mbaqanga. It took him a while to get the blend just right. His first solo album was 1963's Trumpet Africaine. In his 2004 autobiography, inevitably called Still Grazing: The Musical Journey of Hugh Masekela, the artist called that project a "disaster" and an "unlistenable mixture of elevator and shopping mall music." By the end of the decade, however, Masekela had pulled it all together and was living in Los Angeles. In 1967, the year his song "Up, Up and Away" was released, he performed alongside Janis Joplin, Otis Redding, Ravi Shankar, The Who and his friend Jimi Hendrix at the Monterey Pop Festival. A year later, his single "Grazing in the Grass" became a No. 1 hit on the Billboard charts. It was an astounding success — and all the more so as a tossed-off track that the trumpeter recorded with his band as album filler in just half an hour. In 1977, Masekela's Soweto Blues, about the anti-apartheid Soweto uprising, was recorded by Makeba, and it reached an international audience. After the stupefying success of "Grazing in the Grass," however, Masekela largely spent decades living in a haze of drugs, alcohol, bad financial decisions and a string of failed marriages and countless other relationships. He occasionally made music, but he was dumped by label after label; by his own reckoning, he hadn't played sober since he was 16 years old. In his autobiography, Masekela estimated that he wasted $50 million, all told. It wasn't until 1997 that he reportedly got clean; he went on to found the Musicians and Artists Assistance Program of South Africa, to help fellow performers struggling with substance abuse. He spent stints living in Liberia, Guinea, Ghana and Botswana, where he worked and recorded with a diverse array of African musicians, including leading the Ghanian band Hedzoleh Soundz. He also recorded the anti-apartheid anthem Bring Home Nelson Mandela in 1986. In 1987, he appeared with Paul Simon on his Graceland album tour alongside South African musicians Ladysmith Black Mambazo and again in 2012 on the 25th anniversary of the Grammy Award-winning album's release. Masekela finally returned to South Africa in 1990, following Nelson Mandela's release. In the meantime, some of his friends and family members were on the frontlines of the new South Africa; his sister Barbara, for example, became her country's ambassador to the U.S. 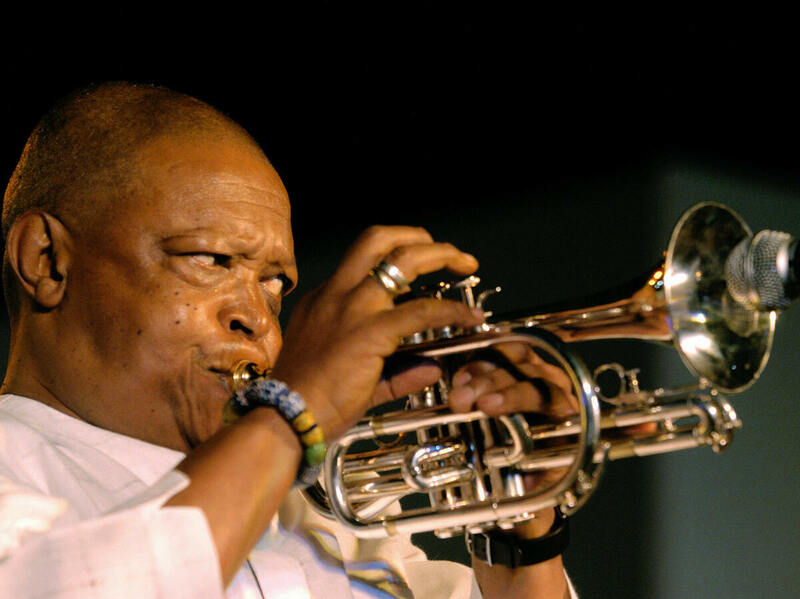 Upon his return, Bra Hugh was hailed as an elder statesman of South African music, and he subsequently recorded a string of international albums. Masekela performed at the opening ceremony of the FIFA World Cup and tournament in Soweto's Soccer City in 2010. That year, Masekela was also given the Order of Ikhamanga in gold, his home nation's highest medal of honor. He had been scheduled to tour the U.S. this spring with his former bandmate Abdullah Ibrahim. But last October, he announced that the cancer that he had been battling off and on for nearly a decade had returned. Among those marking his death is South African President Jacob Zuma, who released a statement on Tuesday: "Mr Masekela was one of the pioneers of jazz music in South Africa whose talent was recognized and honored internationally over many years. He kept the torch of freedom alive globally fighting apartheid through his music and mobilizing international support for the struggle for liberation and raising awareness of the evils of apartheid. ... It is an immeasurable loss to the music industry and to the country at large. His contribution to the struggle for liberation will never be forgotten." A previous version of this post incorrectly referred to the band Ladysmith Black Mambazo as Ladyship Black Mambozo.